And there they were, before us again, those wretched trees. There was no escaping them. Anna slipped into the gloom without a backward glance, left me. I had my knotted rope around my neck and clutched at it now, thinking of untying it to blow our way clear of the tightness of the place and crowding birds and the like. But as I followed Anna into the woods I stilled my hand. The place was going to get worse before it got better. I should wait until things got very bad indeed before I unknotted my rope. That things had worsened since we’d gone to Boscastle, I soon knew, for the path had narrowed to almost no path. Before, it had let me and Anna walk side by side almost as far as the quarry, but now it was hardly wide enough for us to pass at all. The brambles snaked their way across it. Lumps of moor stone had rolled in and taken root. There was a cry above me, then the sound of washing being shaken out. The birds were back. They shuffled on the branches, barely room for them to perch and stare at me with their eyes that gleamed even though there was so little light. Most of them magpies. They began to jump up and down so that the trees shook like they were having fits. I feared the creatures would fly at me if I moved so I tried to stand as still as I could. There was no sign of Anna. It was then I saw something else moving. The trunk of a tree twisting, turning, as if – as if undoing itself. A shadow opening, reaching. She had been sitting on a fallen tree, her black shawl making her a part of the woods until she chose to reveal herself. To let me see. She moved a little, resettled herself, and I saw her scarred hands. All the rest of her scarred too, she’d said, from the fire, aside from her face which was marked only with age. Her face tilted now to look at me, her eyes bright as the magpies’. I had the feeling that everything around me at that moment was leaning in, trying to get close to me. Close enough to hear my heart stuttering. I was glad, then, that Anna had gone on without me. She’d have called such a tale fanciful and stopped the telling. She had no heart for the ways of the people in my country. How could I forget? I’d been thinking it. To burn the place, to be rid of the closeness. The hatred. And she knew. ‘Did the nail go through it?’ I felt my stomach heave as the words escaped, but I couldn’t keep from asking, nasty beast that I was. A cripple and a blind man. The woods weren’t kind to bodies. And to mine – what might they do to my flesh and my bones? To Anna’s, too? I asked Mrs Haskell if Anna had passed that way. ‘Anna doesn’t know how to look,’ I said. ‘Not like you, my bird. Your eyes are wide open.’ Mrs Haskell patted my arm. ‘On you go, then, fly away home. You don’t want to be too long out here, things being the way they are.’ She sat down on the fallen tree again and pulled her black shawl more tightly around her – so tight she might crush her throat, I feared. Her back was to me. She seemed to sink into the tree beneath her, to find the place she slipped into shadow. ‘Why, the saint, of course. He’s with us in the woods.’ Her voice was growing fainter, even as she sat a few feet from me. I reached out to touch her, to prove to myself that she was there. The birds took to the air. I found Anna at the cottages. She was talking with a young woman I didn’t recognise – a pretty thing with red hair and the bones of her cheeks sharp enough to draw blood, but her face was grey with slate’s dust, which I knew Anna wouldn’t like. Anna was all for washing. But I hastened over all the same. Anna was mine. No one else’s. I needn’t have worried. The talk was thieving, not kissing. Two more things had vanished since that morning – a brooch belonging to this young woman, and a christening spoon of Richard Bray’s. ‘Where did you keep your brooch?’ Anna said. She held out a small lump of coal. ‘Did you see anyone nearby before the brooch was taken?’ Anna said. A man was hurrying towards her, carrying a bawling child, which he thrust at the young woman as if ridding himself of a violent animal. Anna and I left them to their worry and made our way past the cottages in the direction of the summer house. ‘The thefts are increasing,’ Anna said. I glanced about me as we passed the last few cottages, and met stares in return. Folded arms. Children herded indoors and doors banged shut, bolted. The Haskell girls, making their way home, skirted us, their squabbles forgotten. We were strangers in that place. It was late by then – too late to cross the river and see Miss Franks and Mathilda to ask them about what we’d learnt in Boscastle, too late to ask the squire the same. Climbing the steps to the summer house door I caught sight of something stowed beneath the wooden slats. A basket, the cloth cover tucked in tight to keep out the birds. 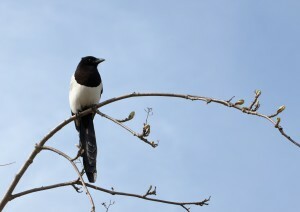 But the care wasn’t needed today, for in the magpie tree there was only one bird. If the tree was Saint Nectan’s, did that make the bird the saint’s own too? The magpie watched me take the basket and make my way inside, and I was sure it watched me long after I’d locked the door. We were tired after our day asking questions and didn’t have words left for each other as we ate the food brought us – bread and hard cheese, some salted fish that dried my mouth so badly I wanted to stick my head under the waterfall. When we had finished eating, Anna took from her black bag the broken piece of por-s’lain we had found outside Miss Franks and Mathilda’s cottage – the bottom half of the woman in the pink dress, birds gathered at her feet. Anna put it on the window ledge, and next to it I put the lump of coal I’d taken from the road to Boscastle, and Paul Haskell’s rabbit snare. ‘Do you think Paul Haskell is dead?’ I said. The Magpie Tree by Katherine Stansfield, out on 22 March 2018, is her third novel, and the second in her Cornish mysteries series published by Allison and Busby. Katherine lives in Cardiff.